Throw out your hands, stick out your tush, hands on your hips, give ‘em a push! You’ll be surprised you’re doing The Behind the Scenes Pic of the Day! Ahoy, squirts! Quint here with today’s Behind the Scenes Picture. I really love this shot, but it’s one of that BTS pics that technically is behind the scenes, but it could also be a publicity still. Call me crazy, but I don’t remember this moment in Blazing Saddles. That’s clearly the set of the “French Mistake” musical moment and looks like Cleavon Little and Gene Wilder are taking a dive in the pool. And look, that’s Mongo in the back far left! I know this is a crazy sequence as Mel Brooks’ awesome crazy western spills over to all the other movies filming in the backlot (inspired comedy, by the way) so it’s possible this happened in the background somewhere and my old brain just doesn’t recognize it, but whatever. 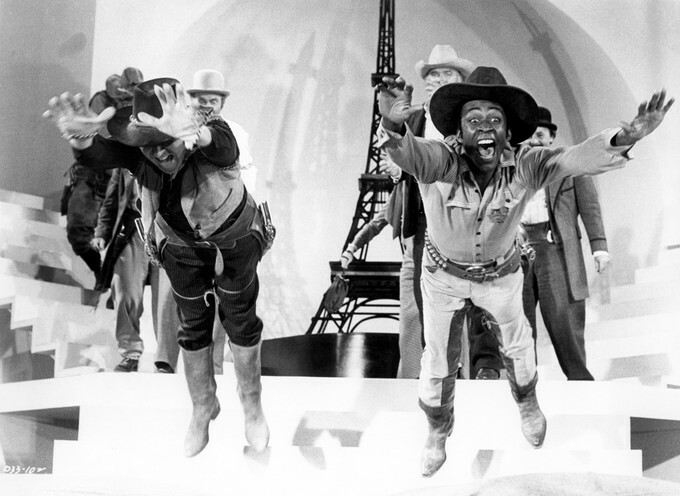 Cleavon Little and Gene Wilder are too awesome not to share this pic from one of my favorite films. Thanks to @TheGookie for sending this one my way. Tomorrow’s pic has a great scream.